We are speaking about building the organic traffic, the most valuable traffic you can dream of: long-lasting, highly-targeted and free. Stijn represents the “MightyCall” company ( by the way, there’s an integration module for X-Cart 5, that enables a very informative and beautiful Contact Us form, powered by MightyCall), Mike is the in-house SEO expert of X-Cart, and though none of us can afford wasting thousands of dollars of investors’ money, both companies managed to achieve the success the competitors only dream about! And we’re ready to show you, how! Mike and Stijn kindly shared their slides with us. You can download them below. Stijn can cover the complete spectrum from business and strategic planning, market research, product management, positioning, business growth and development, and digital execution, to channel and go-to-market strategies. Stijn was a B2B Sales and Marketing Leader at Microsoft across Product, SMB, Public Sector and Enterprise segments. He brings 15+ years experience in senior leadership roles, of which 10+ with global responsibility. Visitor growth to mightycall.com. All Paid Search (red) was stopped in September leaving mostly Organic (green) and Direct (Blue) traffic. Stijn Hendrikse is also the author of several publications I love very much. This is one of my favourite ones – I believe that this is a must-read for any digital marketer: What Digital Marketers Can Learn From the Slow Food Movement. Michael understands Google, Google understands Mike. Sometimes Google even wonders if Mike is a not a human being too: these 2 guys speak a common language! 😉 All joking aside, Mike has been studying the Search Engine Optimization for years, applying his vast knowledge daily. And his comprehensive and careful approach is rewarding: our traffic keeps growing. After the speakers finish their presentations, you’re welcome to ask your questions to our experts! Q: How do you feel about the structure regarding coding W3C, etc. How much of an impact does it have? A: It’s a nice thing to have no errors at all, though it’s not always necessary. The less errors you have the better, of course. The point here is to have less errors than your competition on Google search. Q: What are the best steps to optimize 4.4.3 store and 3.5.4 store with html catalog function? For example on 4.4.3 store is it best to use html catalog, or use apache clean url? for 3.5.4 store, is it best to use html or php pages? Since things have changed so much. A: Both the catalog and PHP pages with clean URLs, as this feature is called in current X-Cart versions, will work. PHP is easier to manage, thus most people choose them. HTML catalog is used when you have a large inventory and would like to get your store work faster. It won’t do, however, if you update your inventory often. Q: What is best way to determine customer search habits on our site? A: To determine search habits on your website you setup tracking the search in Google Analytics and see what your customers are looking for. If you mean search habits of the people in your niche on Google, which i mentioned on the webinar, then it’s a tricky thing with no plain straight answer really. Basically, you determine like 100-200 of keyphrases your prospects are likely to be searching for, then determine their popularity and analyze results for these searches for the geographic area where you’d like to rank. Then you get idea of what people think is good and what the search and look for most. And then you act on it. Q: If I have a client add me as an admin to their Google Analytics account. There is already a UA-tracking code created under their account. I’m using that tracking code in the Google Analytics module in xcart. However, when I link the domain to Google Webmaster Tools – it generates a different tracking code which I cannot add to the xcart module. What’s the best way to handle this? A: To connect the Webmaster Tools account to Google Analytics one you need to be logged in with a Google account that has admin level access in both the Webmaster Tools and Analytics. So you need to add your account to both and grant admin access to it. Then it should validate without requesting any code added. Q: Is there a minimum word count before content is considered duplicated? In other words, when you say duplicate content – are we talking 1 sentence, a group of words, a catch phrase? When should I be concerned or determine that content is considered duplicated? A: For Google it’s not black and white – duplicated or not – it’s all grey. What you want is to make the content as original as possible. Generally, it’s considered that if you change 20% of the text Google will not think it’s strictly duplicate. However, if you use this logic, the pages with such texts will never rank well and will not add any value to your entire website. Q: Will X-Cart ever have a dynamic rendering for portable devices capability? 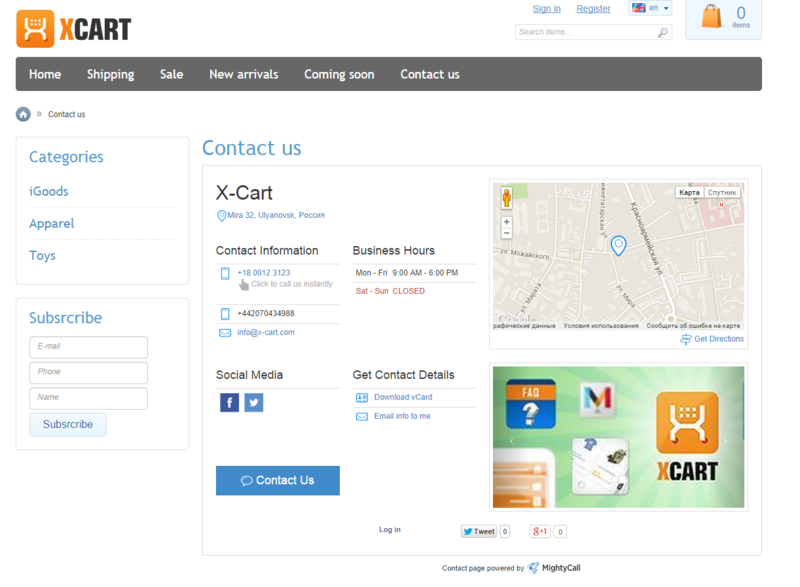 A: If you mean responsive design, it’s already available in X-Cart 4 and X-Cart 5 out of the box. Q: What are the pros and cons of using RWD (responsive web design) over having a separate mobile site or skin from a SEO standpoint? Q: I find that ebay, paypal, facebook and others don’t like products such as knives, pepper spray and gun accessories. Could search engines be dinging use because we have these products on our website? A: Not really. Google does limit what it shows to different segments of its audience, however you will not be at disadvantage with your competition on Google. If these products with sales limitations are not majority of your inventory you might wish to move them to a separate domain. Q: What is the best way to structure your product hierarchy, if you have products directly under a category as opposed to being sat in sub categories, is that more beneficial? A: That depends on the specifics of the store and differs from one project to other. Generally, when you wish to make a product more prominent you put it close to the homepage. Q: Would a single product in multiple categories be considered duplicate content or effect ranking? A: In standard X-Cart behavior – no. The product has the same URL regardless of which category it was opened from. The registration and participation is free, and we’re happy to see everyone. Please note that we have pre-paid 100 seats, and if more people will be going to attend, we will need to upgrade the plan. Thus please register for the webinar now, if you consider attending – this will guarantee that we have seats for all the attendees.